Ok, I’ve finished playing the drama queen over my linen dress. I’m still not 100% happy with it but I’ve had lots of lovely and helpful comments about it (http://www.thesewingforum.co.uk/photoplog/index.php?n=3313 and here of course – thank you everyone) so I don’t feel quite as rubbish about it as I did. Onwards to my next project. Jen and Yvonne (teachers in our Year 1 class) have asked me if I’d make two costumes for their class assembly next month. The children are going to perform the story of “Mary Jones and her Bible” so I need to make a costume for Mary and her mother. 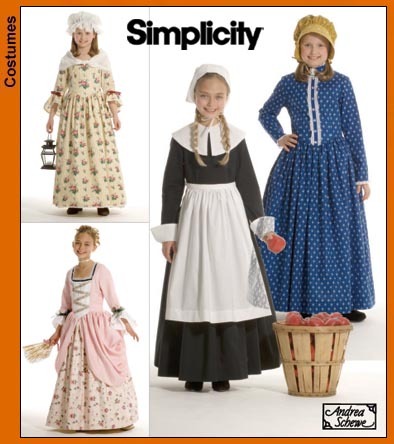 The story takes place in 1800 so I’m looking forward to making my first “historical” costumes. I’m using Simplicity 3725 – view B for Mary and view B but with view A’s bonnet for her mother. The story of Mary Jones and her Bible is the true story of a poor young Welsh girl who saved for six years and then had to walk barefoot the 25 miles to Bala to buy her very own Welsh Bible. Wikepedia gives the factual details of the story but I prefer this version – I can remember being told this version of the story as a little girl in my own school assembly. I’ve just ordered the fabric from Online-fabrics.co.uk – they’ve got a really good offer on crepe at the moment – ideal for the dresses. I’m itching to get started! I’m sure if she’s going barefoot and carrying a Bible she’ll be recognized as Mary Jones, one of my favorite characters.